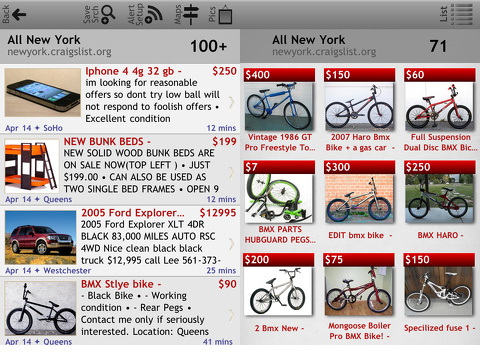 Craigslist Ultimate is the officially licensed Craigslist app by Escargot Studio for the iPhone and iPod Touch. In the history of bargain shopping there have been several major milestones. First there were bargain and second hand stores. With the internet age ebay allowed for consumers to find the best deals from the comfort of their own home, with a small fee charged by ebay itself. The coming of Craigslist further revolutionized the bargain shopping game by cutting out a profit making middleman. Now the mobile app offers exclusive features that aren’t available on the normal Craigslist.org site. The app’s search screen is simple and easy to use. You select what category you want to search, ranging from jobs to housing to items for sale. You select your location, with the option to choose multiple cities to search simultaneously. Lastly, you have the option of choosing from a short list of filters to help further refine your search. Your search results come in a scrolling screen with thumbnail photos. There is also a GPS map to show you the locations of items being sold. The world is a big place and there will likely be a quite a few search results awaiting your perusal, and any experienced shopper knows to compare prices. The app helps out by offering a favorites feature for you to bookmark enticing postings you may want to come back to. Once you see a listing you want to respond to you can e-mail the poster quickly from your device. Posting to Craigslist is just as easy as searching. You sign in with your e-mail account, select a category, write some info about it, and upload photos straight from your device. All your posts will be listed in a ‘My Postings’ category where you can easily access and edit all your listings. For a small fee, users can upgrade to the Ultimate edition and enjoy a number of exclusive features. Craiglist Unlimited stays true to its name by offering unlimited saved searches and unlimited favorites. You can designate background searches for notifications, meaning whenever a matching listing to your background search gets uploaded you can be the first to know by receiving an instant notification. Up to fifteen background searches in up to ten areas are available to send you alerts of listings as soon as they appear. 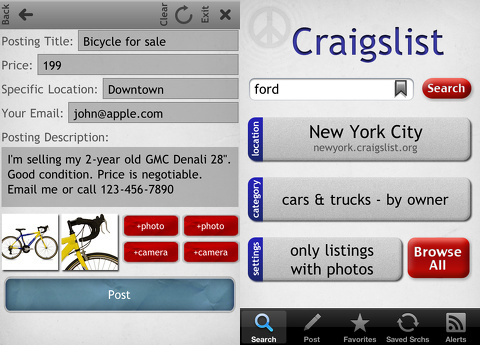 The Craigslist app is free, with the Ultimate version costing only $1.99. If you utilize the notifications system, the Ultimate version should make its money back through the money you save in no time. With minimal setup you can have the Craigslist Ultimate App doing all the bargain shopping for you so you can go out hitting the thrift stores the old fashioned way. AppSafari review of Craigslist Mobile Ultimate for iPhone was written by Neema Akhtar on September 24th, 2012 and categorized under App Store, Featured, Shopping. Page viewed 5601 times, 1 so far today. Need help on using these apps? Please read the Help Page. I was purchased this from app store. This Craigslist version not avail in us store any more. No support for this app. Alerts do not get saved. Whenever the app gets closed all alerts that have been set up disappear and have to be set up again. App restarts itself after so many days of being open (maybe 5 or so). No response EVER from their support.